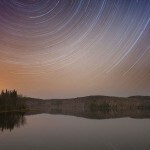 A four-hour exposure over Arrowhead lake spins the night sky, ushering in the camping season of 2009. 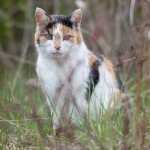 A cat that seems to be living wild around the RCYC islands looks like it’s doing just fine living off the landscape. Does anyone know who this cat is? 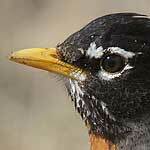 The delicate details of a robin’s face exemplifies the sharpness of Canon’s EF 300mm f/4 prime telephoto. 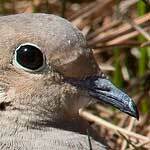 A mourning dove relaxes in the half-grass of spring, with a closeup of its wonderful facial feathers and catchlight. 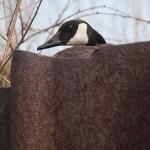 The only armoured nesting site on the Island is always one of the first to be occupied in the spring by returning Canada geese. Lucy the Canada goose sets up shop on the dock of Yael’s houseboat. 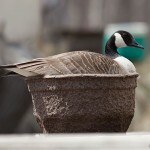 The planter wasn’t there for the 2010 season, so Lucy nested in a planter on the dock of the Boat House on Centre Island. 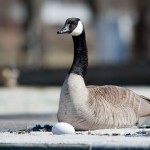 Early spring 2009, and a Canada goose inexplicably lays an egg on an IYC dock. Do they sometimes lay eggs before their nest is complete? 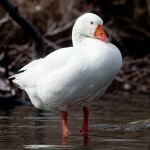 A goose proudly stands guard near its nest, on a small point of land just off of Doughnut island. 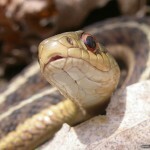 A garter snake emerges from its own coils early in the spring of 2009. 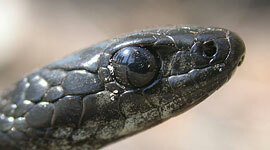 The jet-black eye of a melanistic garter snake reflects the photographer and bystanders under a clear spring sky. 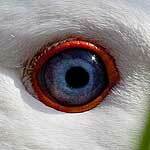 The wonderful blue eyes of a male goose lurking in the shade near Doughnut Island. 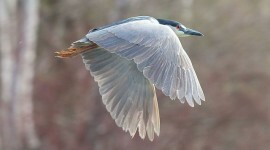 A newly returned black-crowned night heron wings its way past Snug Harbour. 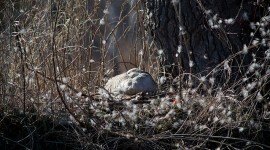 A goose sits on her nest near Doughnut Island, surrounded by down blown off the nest by high winds.